Here’s a slightly different version of our early fantasy premier league teams DGW34 FFGeek team article. 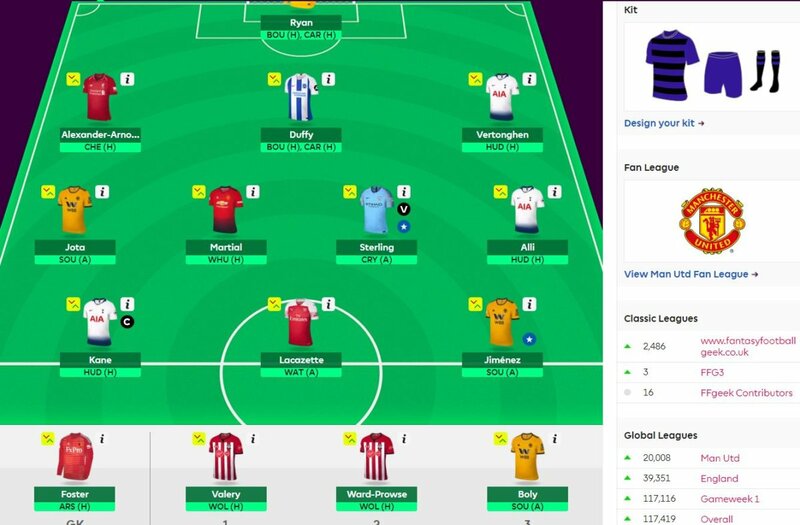 I’m already elbows deep in my wildcard so it’s a team score update, 1 small change to the wildcard team and a few further random thoughts on the team at the moment. I was hopeful for a decent gameweek going into it and thankfully it panned out that way. 5 returning players (if you count Barnes) including two double figure point hauls. 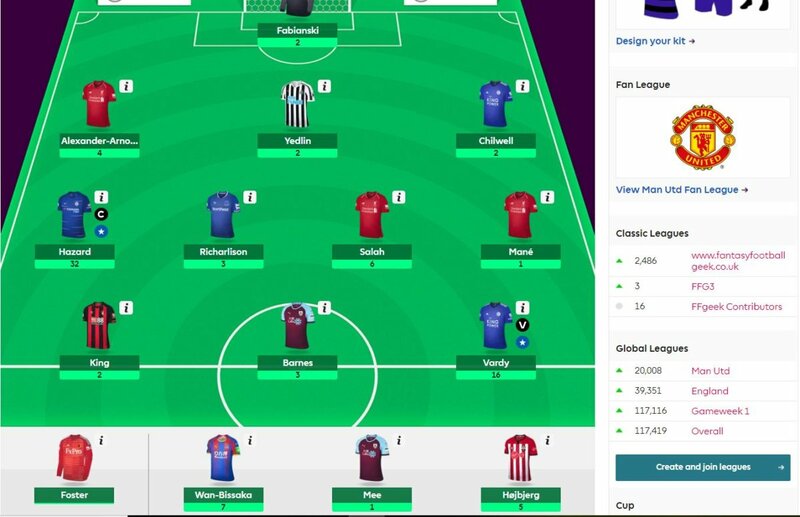 A gameweek rank of 205k, my 4th best of the season and getting the right captain pick were all part of it. Going for Yedlin over Wan Bissaka was a disappointment but it should never have been a Palace clean sheet given how the game went so c’est la vie. A 47k green arrow for an overall rank of 117k. Still far off where I would like to be but at least getting some rank back after the disastrous run of GW27-31. As a general point I’m wildcarding now with the intention of bench boosting in GW35. Everyone apart from Alexander Arnold has 2 games in DGW35. I still have my triple captain which will probably be used for Liverpool v Huddersfield in GW36. That will involve carrying over a free for GW35 or a -4 for GW36 to get in Salah. It could also be Mane. So for me at the moment the only players I feel safe in my wildcard team are Kane, Jimenez, Jota, Vertonghen, Alexander Arnold, Foster, Ryan and Duffy. Given that’s only 8 of 15 players it’s not exactly a stable situation. One of the things concerning me is who will be the captain favourite in GW35? I would like them covered. I have a feeling it will be Aguero or Kane. I’m not sure who else it could be to be honest? I can easily swap Aguero for Sterling and ditch Lacazette although I’m already struggling in midfield as it is. That could be counter balanced through more investment in defence but to avoid a low point ceiling wildcard I need to get some attacking defenders in there. I will be putting a DGW34 captain poll out and I’ll do a first by adding in a speculative DGW35 one which will be interesting to see the results. It could be a very interesting 2 gameweeks as I don’t see a template particularly so the points spread could be massive. Who’s on the FFG wildcard not sure list? It’s alot bigger than I’d like. If your wildcard team is settled and your just going to check on the manager press conferences for injury news on Friday then I envy you! Lacazette – I just don’t trust the manager at all. The fact that a player with the quality of Aubameyang has started 4 of the last 6 on the bench just says it all. Alli – Just his deeper position in the last 2 games I do not like, much as I think he is a great player. As a support striker yes. As a CM no. Tonights game v Man City maybe the deciding point. He will be replaced by Eriksen if he goes as I’m definitely having 2 Spurs attacking players with Hudderfield in GW34. Sterling – It’s him or Aguero and that may depend on my DGW35 captain thinking. I think Sterling is brilliant it’s just 2 players at that price given Pep’s rotation is a step too far. Boly – There will be a Wolves defender it’s just whether I take the risk of Doherty’s DGW35 gametime for the additional attacking potential. The remaining 2 are Valery and Ward Prowse who are just fillers and could be replaced depending on budget. Btw I keep wanting to put Deulofeu in but I can’t get over him being benched for the FA Cup semi. True he was fantastic and Gray did blow his chances to some extent but still it’s a big decision. I wish I could fit Deeney in which may happen if I ditch Lacazette and stay Sterling instead of Aguero. Huddersfield in DGW35 is an attraction. Good luck with your wildcard tinkering. If you’ve already wildcarded then enjoy everyone elses preoccupation with theirs. If you see someone at work with a glazed look in their eye staring into space that maybe the reason. Or it could be they have real world concerns obviously. Hi Geek, having a similar thought process to yourself actually! After a disastrous BW followed by a FH, the last BW was a good one for me with 79 points, a GW rank of 92k and overall rank now up to 52k. After three red arrows its now two in a row! Regarding Captain choice, while Kane and Aguerro might be the traditional choices, Murray and Duffy both get more than half the number of points per game and don’t have the CL to deal with. Aguerro is a game time risk and while Kane is rarely rested Spurs could feel they can beat Huddersfield without Kane. I am leaning towards Duffy as captain and would like him included in any poll. I’m with you on the Brighton captaincy, although I reckon I’ll be going for Murray. In the last 16 gameweeks Murray has returned twice – a 5 and a 12. I can see that attraction of the fixtures, but captaining him would be a punchy move. I’m with Tom on this one, good fixtures – frisky move. To be fair Spurs realistically don’t have an alternative to Kane. Although LLorente recently recovered from injury. IMO both Spurs and Kane should want to get him firing at their new ground. And who knows, goal difference might even be at play for top 4. Will be interesting to monitor whether Aguero has been able to shake off his injury as well. I’m currently leaning towards Kane. Son would probably be my favourite speculative option with his explosive potential. Who would have thought FPL would even make Champions League games more exciting? Alli to Eriksen for example along with improving the bench for the BB. Worth considering as there is plenty of goals in that Watford side. I am wondering about leaving out Liverpool players from my WC, I am in same boat as you with WC followed by BB the following week. Whilst Liverpool don’t have 2 matches, they do play Cardiff. With all other big 6 clubs playing each other, or in arsenal’s case having undesirable fixtures combined with rotation risk, I’m wondering if the scope for big points is as strong for the likes of Mane and Trent etc as it is for any of the other big 6 players, even though they only have one match. Liverpool also finish with 4 great consecutive fixtures. What do you think, are you tempted to keep hold of an attacker as well as Trent? Preplanning free transfers a few weeks in advance feels risky as there will usually be unexpected issues we have to use the free transfers to resolve. Why would you keep TAA when he doesn’t have a double? Rob that’s exactly my point, alongside mane/salah. Is a single for Liverpool as good as/better than a double for say man utd away to Everton and then City. Or City playing utd away and spurs? Though offsetting that Liverpool have Chelsea this week compared to United having West Ham and City having Palace. (Though having Liverpool players does set you up for week 36). I don’t have any Liverpool players in my provisional team though that might change, I will certainly get one with my FT in week 36. Kane appears to be injured. Will make for some interesting changes. Yes I noticed that this morning. Now what to do?… Llorente instead or go with Son and Eriksen. Son looks back in form so doubling him with Eriksen now looks wise. Who to replace Kane with however… Aguero, Laca or Rashford only options for me really. Hi Geek – Why Eriksen over Son?